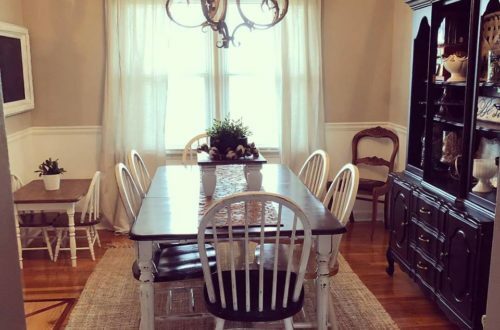 Minor uplifts to a room do not have to take tons of money or major creative juices. But, it does take time. Ha! Lately, I feel like the time stuff gets stickier and far more difficult to even tackle those minor changes. 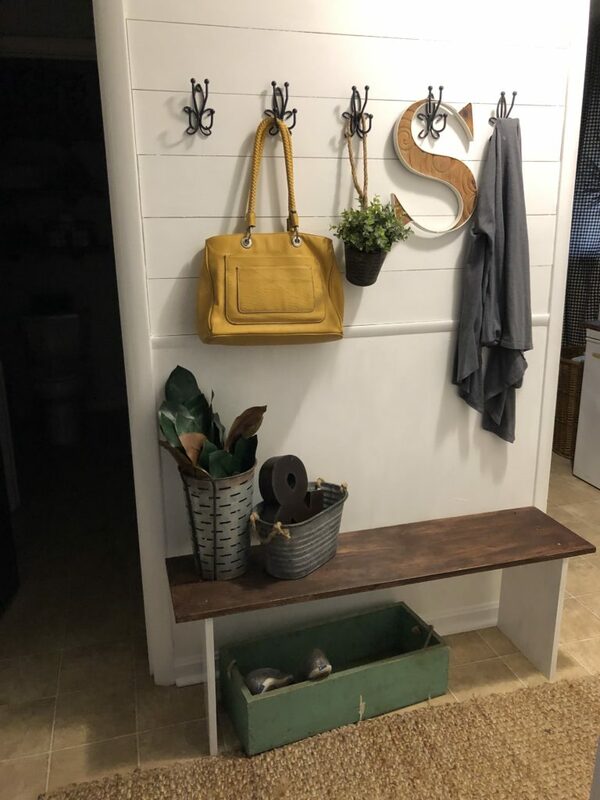 I had placed the coat hooks in the spot where hooks were when we moved in, but it wasn’t a practical height especially when I really wanted to leave the bench there for a place to throw unwanted shoes when entering the house. 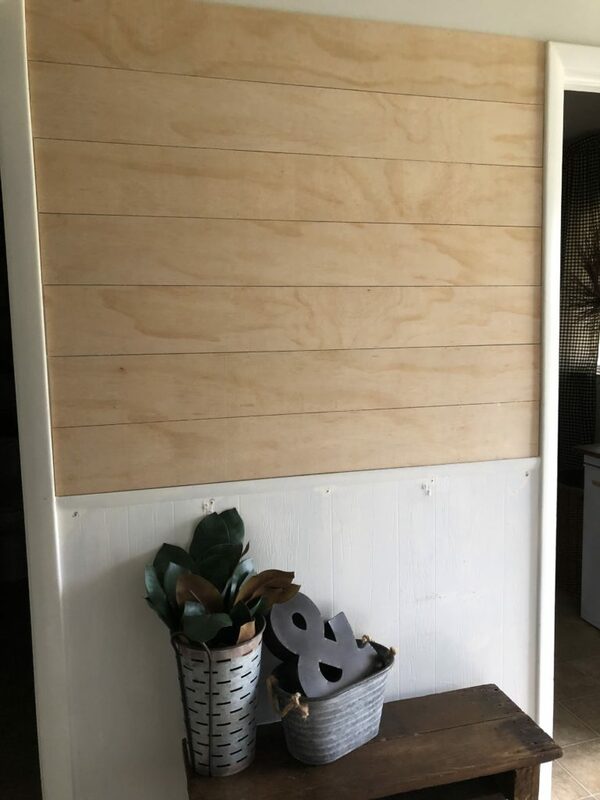 So, after lots of imagination and trial and error, I decided to ship lap the top half of the wall, repaint, build a pretty shelf for fun decor, move coat hooks up higher, and build an imperfect new bench. I had quite a bit of under-layment leftover from the laundry room reveal. So, this was a pretty quick task of cutting them the length and width I wanted. The not so perfect bench was just leftover pieces I had on hand, a bit of gel stain, and a good coat of white paint for the legs. 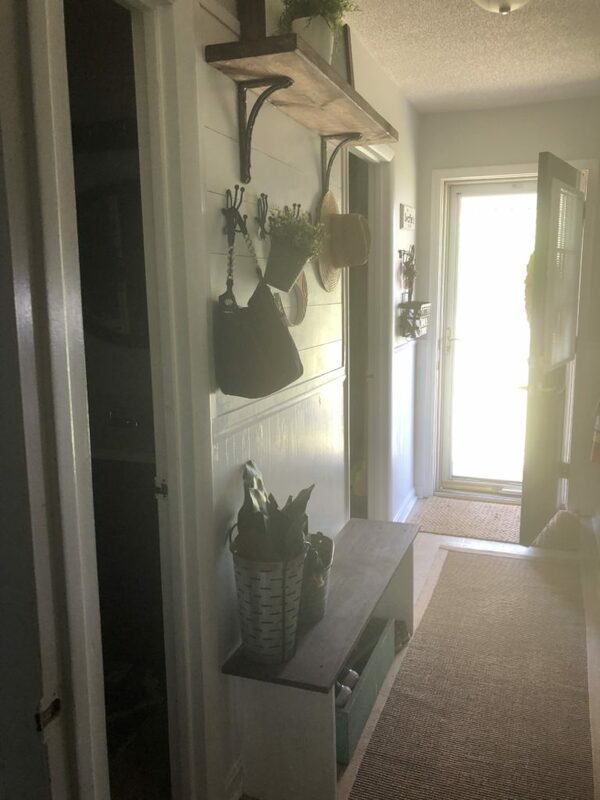 A fresh coat of paint throughout the hallway definitely helped the whole look too. I’m not sure why, but both times I’ve painted the bottom half of this hallway it does weird things. Like the strangest streaks show up weeks later and it looks awful! After it happened the first time I thought it was the paint, but I used the best paint out there, and it is now showing through again. So, not sure when I will have time or energy to paint it over…perhaps one day. I used some of my birthday money to buy these old rusty brackets for the chunky shelf. This was the only money that was spent on this project. Everything else came from my decoration or supply stash. Moving the hooks up higher created a bit more hanging space above the bench. 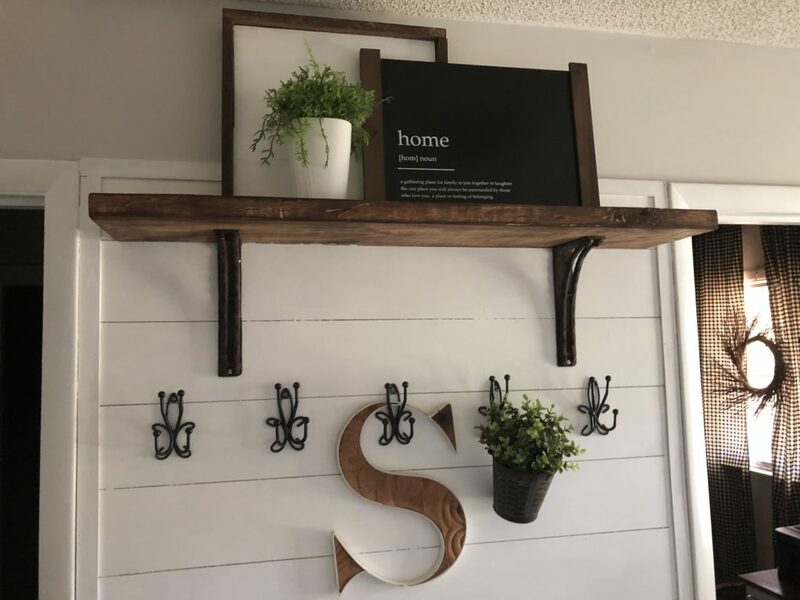 I used gel stain to stain my chunky shelf and threw a piece of my decor pieces up top. I am super in love with how it turned out! 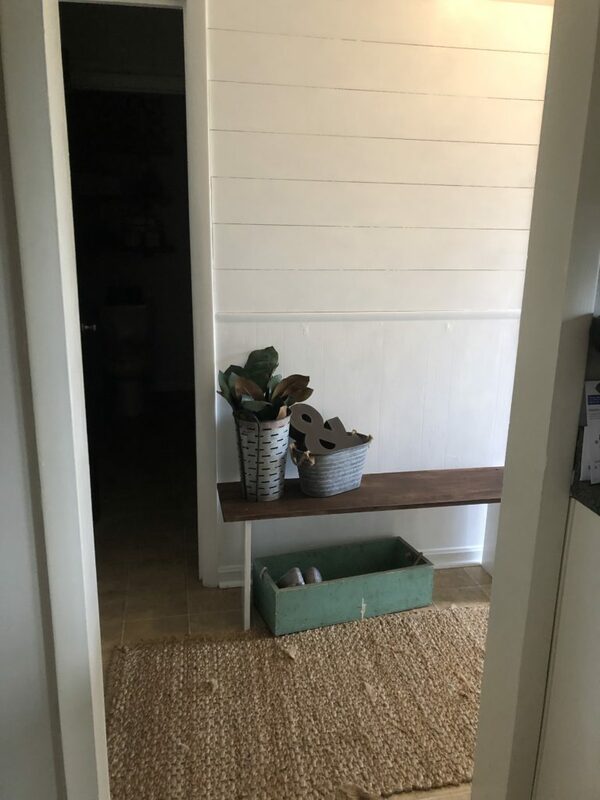 The sunshine that daily pours into this little space makes it quite welcoming. 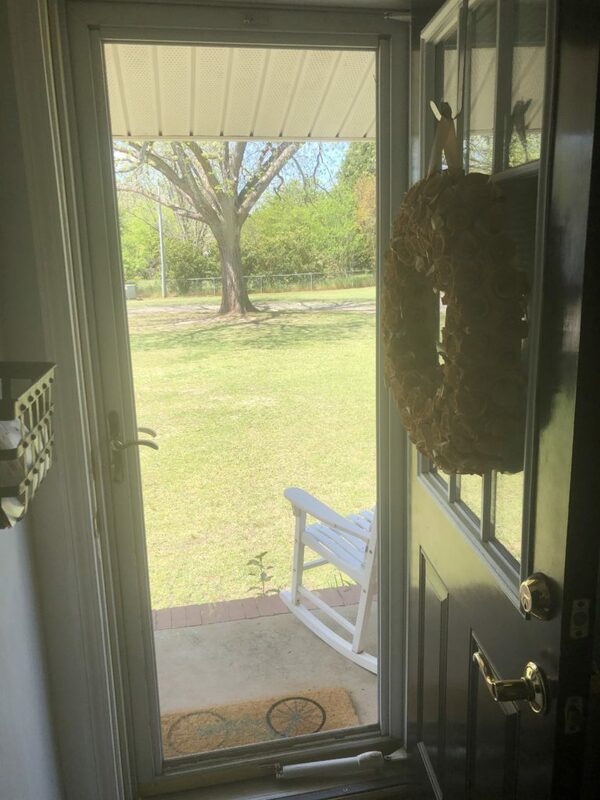 Our door is always open and it is joked that it is a revolving door. But, honestly, I wouldn’t have it any other way! 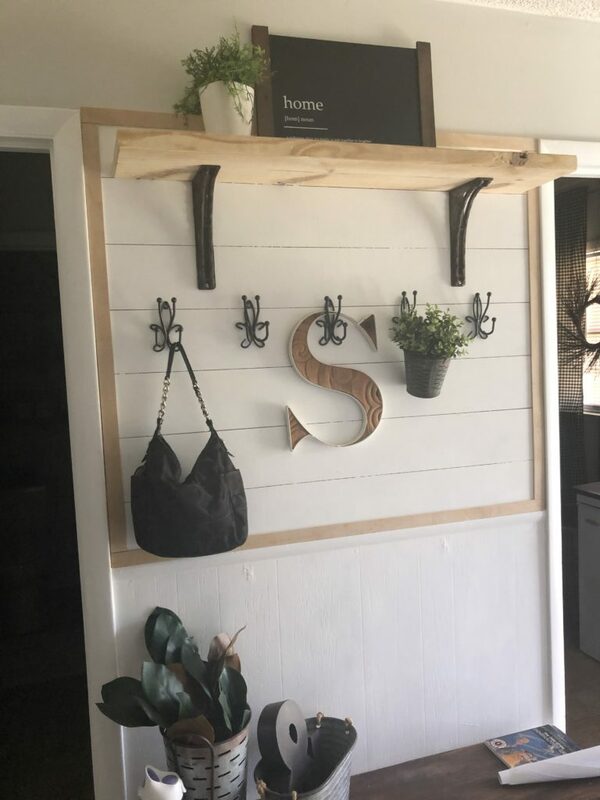 So, when you stop over for coffee and cookies, you’ll have a perfect place to hang your purse, coat, hat, or kick off your shoes. 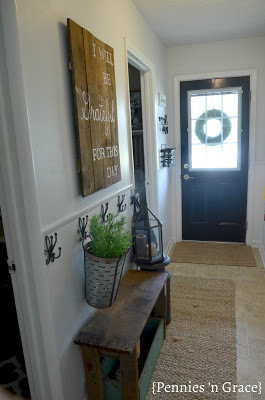 Love the hallway, definitely welcoming.